When you are planning a holiday event, you can use this cute holiday flyer template to advertise your up coming holiday occasion. This template is perfect for personal or business use. It can be used to advertise for parties, business or charity events or even sports league dinners. 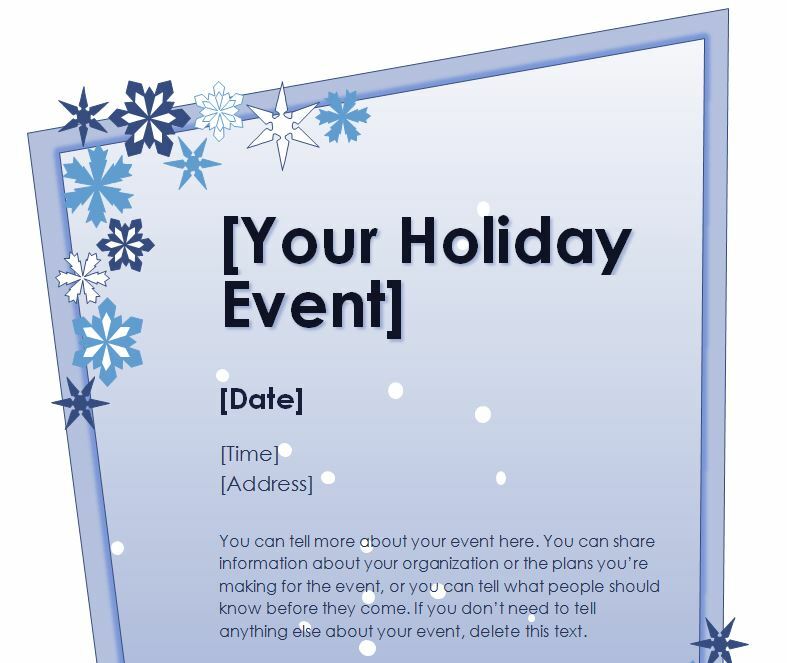 This template will save you so much time when creating holiday themed fliers. This cute holiday flyer template is available for download free on this page. The template can be fully customized using the Microsoft Word application. It is very easy to use this template to create your personalized fliers. First you will need to download the free template to your computer by clicking on the download button on this page and selecting where to save it. Next you will need to open the file up in the Microsoft Word application. You can do this by double clicking on the file itself, or right clicking on the file and selecting the “open with” option and then selecting Microsoft Word as the program. Once opened, you need to customize the template with your information. To edit a field, simply use your mouse to click once inside the field you wish to edit and enter your information. After is it customized, you have the option to either save the document or send it to print. When you save the file to your computer, you may want to make an extra copy of it to edit. If there is any trouble with the customization you will have the original file to go back to. Although you may be able to open this template in the Open Office software, it will not have the graphics that are expressly in Microsoft Word, and there may be problems in editing the customized fields. When creating the flyer, you can print different sizes of the flyer by selecting the print options and changing the paper output and the number of prints per page. This cute holiday flyer template has too many uses to list here. Once you see how easy it is to edit, save and print the template, you will be happy that you have a copy for yourself. Enjoy this free holiday template.